The attorneys of Siegfried, Rivera, Lerner, De La Torre & Sobel, P.A. have been called upon regularly throughout the years by the media for our insight on the issues affecting community associations. With the passage of the new condominium association law in Florida, we have had the opportunity to write a guest column on the law’s impact and shortcomings that appeared in the Sept. 27 edition of The Miami Herald’s Business Monday. We have also provided our insight and opinions to journalists with the Sun-Sentinel, Miami Today, ABC News, Investor’s Business Daily, and other major news outlets, and they have quoted our attorneys in their reports. The South Florida Sun-Sentinel also turned to Mr. Blanch for its report on Wednesday, Aug. 25, entitled “Renters May Be Forced to Pay for Deadbeat Condo Owners.” The article discussed how condominium associations which are working with our attorneys are now collecting the monthly rental fees directly from the tenants of unit owners who are delinquent in the payment of their association fees. 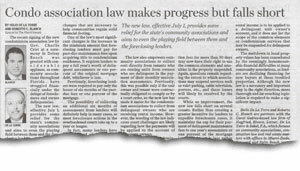 Blanch and other firm lawyers who focus on condominium associations and homeowners associations were also quoted extensively in reports on the new law and other issues affecting Florida community associations by Miami Today, ABC News and Investor’s Business Daily.